This Hanukkah, instead of preparing the usual greasy and oily latkes, try this Potato and Zucchini Latke Recipe! You get 3 latkes with a side of tzatziki sauce for just 5 Points. They are made with potato and zucchini which helps lighten them up and get the Points value lower. But the best thing though, is that these latkes are SO incredibly delicious! And I truly think they are even better than traditional, all potato latkes. The flavors are delicious and the fact that they aren’t soaked in oil makes them light and crisp. Served with a side of fresh homemade tzatziki sauce, these are a MUST make for Hanukkah. Even if you don’t spin the dreidel, serve these Potato and Zucchini Latkes up anytime and treat the family to a healthy and delicious side dish! Light and delicious, these non-traditional latkes are the perfect Hanukkah treat. Served with a fresh tzatziki sauce, each serving has just 5 Points! Toss zucchini, potato, onion, and egg substitute in a large bowl. Add breadcrumbs, feta, 1 tablespoon dill, 1/4 teaspoon salt and 1/4 teaspoon pepper; toss to combine. Form the mixture into 12 patties. Generously spray a large nonstick skillet with non-stick cooking spray and set over medium-high heat. Add 6 patties, cover and cook until crispy and browned on one side, 2 to 5 minutes. Carefully transfer the latkes to the prepared pan, browned-side down. Repeat with the remaining latkes, and re-spray pan with cooking spray as needed. Meanwhile, prepare tzatziki: Combine yogurt, cucumber, vinegar, the minced shallot, 1 tbsp dill and the remaining salt and pepper in a small bowl. 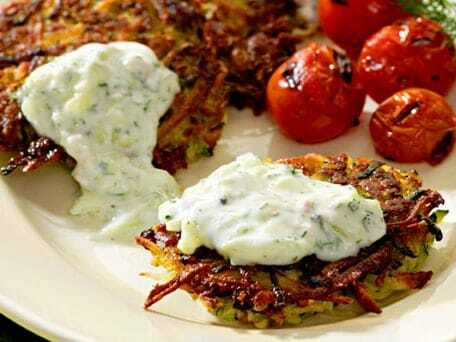 Serve the latkes with the tzatziki sauce on the side. so I tried these last night–I was craving latkes even though it’s no where near Hanukkah time… and mine came out too fine, I think I need to use a different sized gratter. And I was hoping to not taste the zucchini so much, as my fiance hates it…but overall it wasn’t bad–I’ll try it again and see if I can do it better next time. Can you please advise the point value per serving without the tzatziki sauce? The tzatziki sauce only has about 2 Points + for the entire recipe, so eliminating it from 1 serving will not affect the Points + value. Where do you get the liquid egg substitute from? (what is it?) and is it possible to use real egg? When I say “liquid egg substitute”, I’m referring to products like Egg Beaters. You can absolutely use real egg, but it will increase the Points value.